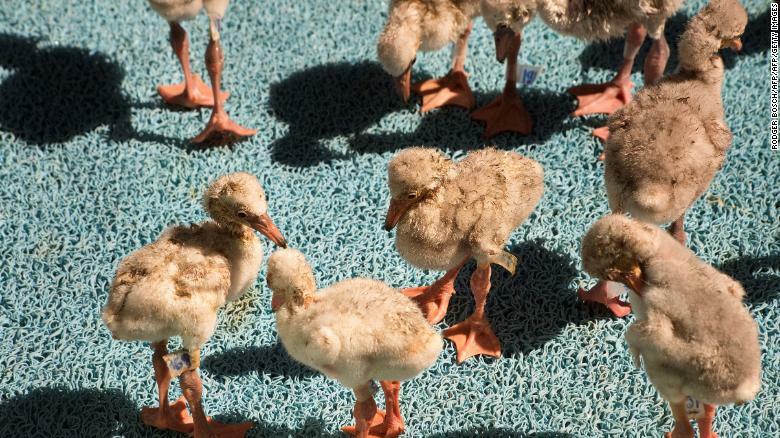 Thousands of flamingo chicks have been airlifted from their dried-out habitat in northern South Africa in a desperate attempt to save them. 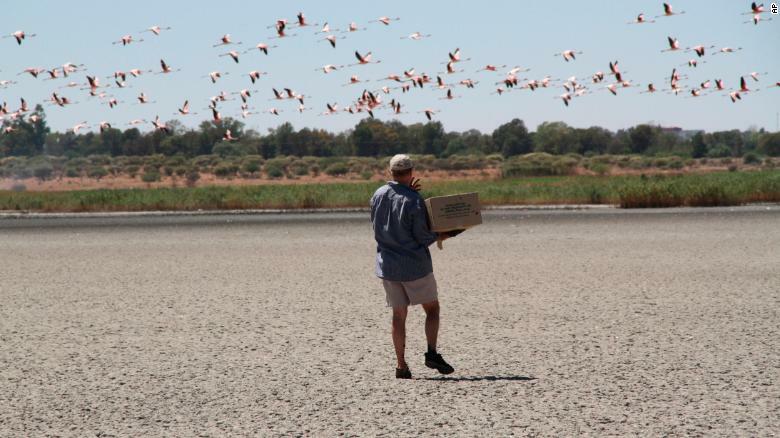 Around 2,000 Lesser Flamingo juveniles were rescued from the Kamfers Dam near Kimberley at the end of January, after their parents abandoned them following a significant drop in the dam’s water levels brought on by drought conditions in the northern Cape. The Southern African Foundation for the Conservation of Coastal Birds (SANCCOB), one of the organizations caring for the chicks, has been canvassing for donations of food and cash, and volunteers to hand-feed the stricken birds. 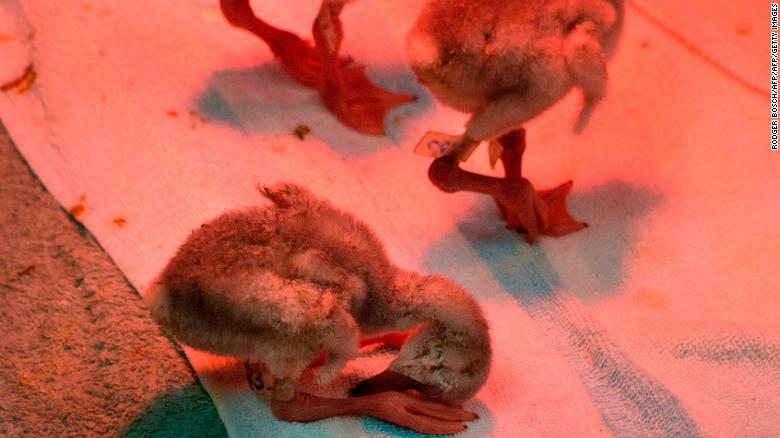 Rescued chicks rest under the red light of an incubator early in their rehabilitation. Katta Ludynia, the research manager at SANCCOB, said that around 550 birds were transported to the foundation’s Cape Town facility by car and by plane. “These chicks arrived in a very bad condition since a lot of them were dehydrated, they were tiny — some of them were just coming out of their eggs — so we had a little bit of a problem with infections. “By now they’re all stabilized, they get medical treatment, they get regular feeds” of egg yolks, baby formula, prawns and fish. In between feeds, Ludyina says, they’re also fed electrolyte fluids to aid their rehydration. Flamingo chicks bask and preen in the sunshine. “These chicks will be with SANCCOB for probably another three to four months, until they’re ready to be released back into the wild,” she said, adding that she was not sure if they would be returned to their birthplace or released elsewhere. A growing number of the chicks in SANCCOB’s care are gaining strength and video posted to its social media pages shows chicks walking and preening in the sunshine at its Table View facility, after spending time under incubation heat lamps to aid their development. The naturally formed Kamfers Dam sits at the intersection of three biomes — the Kalahari Savanna, Grassland and Nama Karoo, according to conservation organization Birdlife South Africa. A volunteer collects flamingo chicks at the Kamfers Dam near Kimberley, South Africa. Manmade activity has changed it from a ephemeral to perennial pan — meaning that storm runoff and sewage from the nearby city of Kimberly, to the south, has turned it into a permanent ecosystem, with the phosphates from the sewage encouraging reed and sedge growth around the dam’s shores. 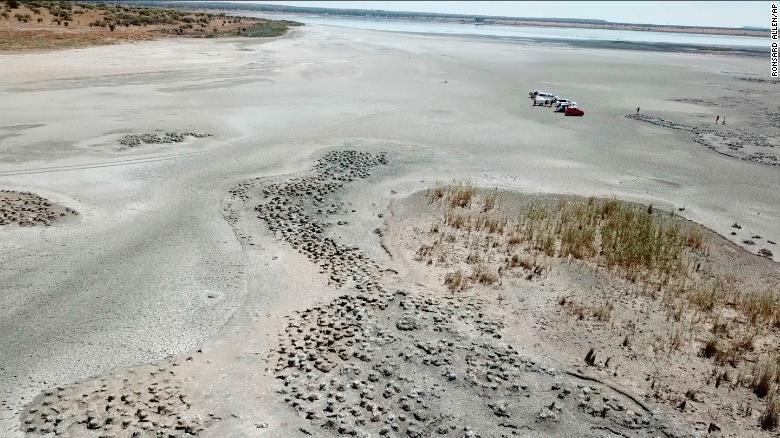 Until the waters began to recede, the dam was “a reliable refuge for waterbirds in a semi-arid area where wetlands are scarce,” the conservation organization explains. A view of Kamfers Dam, in Kimberley, South Africa since the waters began to recede. At least 63 waterbird species have been recorded at the site, “regularly (holding) more than 20,000 birds,” with a record 85,000 individuals counted in 2006 — the vast majority of which are Lesser Flamingos. South Africa, including the southern city of Cape Town, has been struggling with extreme water shortages in recent years, with the southern hemisphere summer of 2018 particularly dry. For months, the city of four million people faced the doomsday scenario of “Day Zero” — the day the taps run dry. Cape Town pushed their countdown clock to 2019, but avoiding Day Zero is still dependent on the rain — something entirely out of anyone’s control. While Cape Town is the first major city to face such a water crisis, it is unlikely to be the last. “The situation in Cape Town is almost a foretaste of what is likely to come in cities worldwide,” Jasper Knight, a geographer and climate expert at the University of Witwatersrand in Johannesburg, told CNN last year. Drought crises in California, Brazil and Spain all suggest a future where water will be scarce. As urban populations increase, water resources are becoming strained.